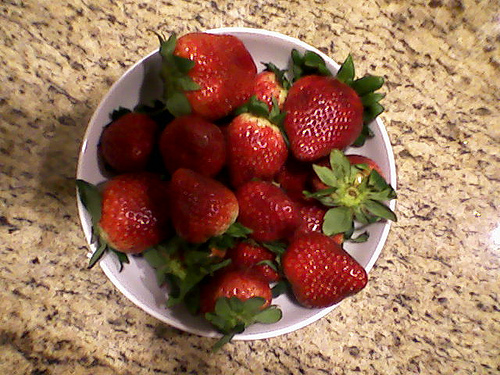 This bowl filled with amazingly delicious strawberries is another example of why I will live in California forever. Things like this are plentiful at the grocery stores. Even in February. We ate them outside where the sun was shining and the temperature was a delightful 70-some degrees. Again, in February. I love California. I'm trying not to be bitter. Honestly. Worst winter in all the years I've lived in Southeast Wisconsin. Then again, the winters HERE are better than where I grew up (Upper Peninsula of Michigan), so I guess I have no room to complain. Except for maybe the quality of the strawberries in February.